The first day of this years Sun 'N Fun started off like clock work early Sunday morning at 09:00 with the QBA forum. The weather was a little cooler than normal this year and it was taking several QBAers a little extra time to get moving. There was a constant trickle of folks coming into the forum tent and at the end we had a standing room only crowd. Everyone had a chance to tell how their projects were coming along. There were several new faces in the crowd. A few of the guys were reporting major progress and first engine starts or taxi testing seemed to be just around the corner. Mark Greenwood presented more information about his new endeavor with the TRI-Q business. There was a lot of talk about the beefed up nose gear and several of the TRI-Q guys validated how improved the model was. We only had four planes make it into the airshow this year. Mike Conlin came in from the Houston, TX area. Mark Greenwood brought his TRI-Q-200 over from around Nashville, TN. Larry Koutz came down from Valdosta, GA and I made it in from Dallas, TX. I entered the SUN 100 race on Monday morning. It was bumpy as heck at 500 feet, but I was able to finish second behind Klaus Savier. From a standing start I turned in an average speed of 214 mph. I'm not sure what my top speed would figure out to be, but this was a 10 mph improvement over last year. My airspeed indicator reads a little slow and I never saw anything over about 205. I got my first indication that speeds were up from last year when I tried to go into the first turn. I applied a normal input to initiate a turn, but nothing happened. The controls had really stiffened up with the 10 mph increase. I had to apply some strong pressure to get the plane to bank. All of my previous test runs had just been straight and level. Cranking it over into a turn at between 215-220 was a new thrill. On Monday evening we had the 3rd Annual QBA Hot Dog Roast. The turnout was above what we expected and we just had enough grub to satisfy the group. I have a feeling one or two of those who attended hadn't had any breakfast or lunch. It was a great chance to talk Quickies for an extended time. A BIG THANKS goes out to Dave and Susie Richardson for hosting this again. Steve Whiteside, the inventor of the BENT "C" antenna, brought along a few radio related gadgets and gave an informal presentation. His first item was called a Tiger Tail. It attaches to the antenna of a handheld radio and increases the transmission strength by about ten fold. He set up a receiving antenna with a meter attached and visually showed the strength of the handheld with and without the Tiger Tail. It was quite impressive. He also showed a gizmo that could be used to verify that your radio is actually transmitting if you can't get a local com check. This device is a simple wire loop with a diode and a capacitor attached. The wire loop is connected to an audio connector that you insert into a common tape recorder. You simply broadcast on any frequency and the loop antenna picks up the signal. If you're using a handheld the loop antenna needs to be within a foot or so of the handheld. If you're transmitting from an aircraft radio you need to be within 5 or 6 feet. Steve has given me some written info on these two items and they will appear in a future Q-TALK issue. The rest of the week everyone enjoyed some beautiful Florida spring weather until Friday when it started raining. It rained on and off for the whole day and finally started to clear near midnight. Anyone who didn't get out on Thursday was forced to wait around until Saturday. On Saturday about 11:00 a.m. the field went VFR and the hordes started to head on home. 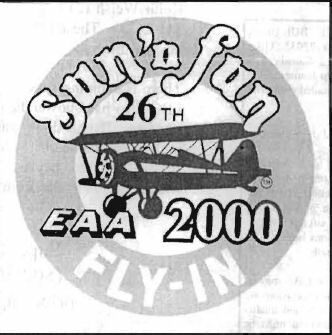 For those of you who haven't made it to Sun 'N Fun, you need to give it a try. Just a reminder! Think about an article that you can submit to the newsletter. Look at your project; find one item that would be of interest to other builders. Write up a small article and take some photos and send it in. Our next QBA Fly-In will be on June 23rd - 25th. There will be a QBA get-together in Mattoon, IL at the Cole County Airport (MTO). From all of the talk on the Internet e-mail list I expect to see a large turnout at this event. There are plenty of good accommodations for us and the management at the airport is really supporting this. For those of you flying in, there will be transportation between the airport and the motels. There are restaurants near the motels for easy access and we will have a dinner Saturday night at one of the restaurants. There are no forums or organized events planned. This will be full blown, pedal to the metal, gawk and talk Quickies all day long. I'm sure there will be opportunities for rides for those of you interested. Sorry no Q-1 rides will be available. If you need additional info, you can contact either Keith Welsh (217-826-2967) or Steve Larribee (217-345-2633). These are the two local guys who will be hosting this. There is camping space available at the airport. The FBO also has shower facilities that are available for our use. If you don't want to camp, then there are several motels nearby in town. Try to get into one of the two listed below. It will help make the transportation to and from the airport a little easier. Super 8 Motel, 800-800-8000, prices upper $40s. Fairfield Inn, 800-228-2800, prices in the low $60s. You can order a PDF or printed copy of Q-talk #80 by using the Q-talk Back Issue Order Page.